It is a well-known fact that the cost of healthcare is increasing at a rate that exceeds general inflation by far, and that medical schemes’ biggest expense – on private hospitals – is ever soaring. Private hospitals are the biggest expense of the schemes and this aspect is now being monitored by the Council for Medical Schemes so that medical aid members can have answers as to why their medical scheme premiums are rising out of control. The annual report of the medical aid’s regulator has revealed that there have been above-inflation increases in health spending. The number of chronically ill medical aid members has increased at an alarming rate, with type 2 diabetes leading the way. It wouldn’t be surprising to learn that medical aid members can add stress to this list. And not because they have to reach deeper into their pockets to pay their medical aid premiums. They would be horrified to know that the premiums they pay each month also go towards funding unrelated items. These include accommodation and meals for ‘meetings’ and ‘conferences’ that the trustees of these medical schemes ‘need to attend’. Even trustees who are not full time employees are still living a life of luxury and coining it. South Africans don’t like parting with money for their medical aids – they don’t like the idea that they are parting with a lot of money each money and have nothing to show for it. They only really benefit when they submit a claim. It doesn’t comfort medical aid members knowing that the members themselves own the medical schemes. Or that they are not-for-profit organisations. And that they are supposed to act fairly, always in the best interests of their members. They don’t see this happening. Members of a medical scheme have a legally binding contract with the particular scheme they belong to and the scheme has rules. Unfortunately for members, these rules contain a list of exclusions that won’t be paid for the member. Medical schemes must make decisions with reference to the rules of the scheme. 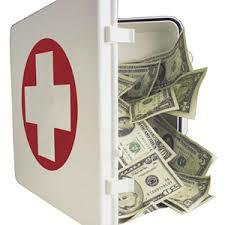 In recent years the medical schemes raked in some R140 billion, paying out R126-billion for medical claims. These medical aids are spending far more on medicines, doctors and hospitals than ever. And this above-inflation spending is regrettably leading to ever higher medical aid premiums. Certainly that is something which most cash-strapped South Africans can ill afford. The biggest part of this premium money was paid for stays in private hospital. A large chunk went to specialists and only a very small percentage to GPs. The council has established that after medical schemes have paid for hospitals, consumers were responsible for about 16% of each bill, and that it was this out-of-pocket spending that is causing so much stress with medical aid members. According to a recent South African Customer Satisfaction Index (SACSI) survey where about 3,300 medical aid policyholders took part, there isn’t one medical aid which is meeting the expectations of policy holders. Medical aid members rated the health insurance industry with a satisfaction score of 74.1 out of 100.